Riverside Park Boat Ramp, Yankton, S.D. On May 8th, 2010 Missouri River Relief once again joined forces with our friends in the Missouri National Recreational River to clean-up the stretch of river below Gavin's Point Dam. The event was hosted by the National Park Service, the Izaak Walton League and the City of Yankton. It was the 7th annual clean-up on the MNRR. Since the beginning, hundreds of tons of junk, including dozens of car bodies, bags of fishermens' trash and the debris of decades of use and abuse have been removed forever.The annual event is an inspiration to communities up and down the river and we're proud to play our small part. 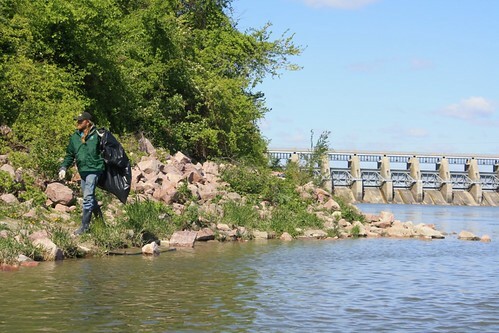 After a cold & windy night, 100 volunteers showed up on Saturday to collect over two and half tons of trash along roughly three miles of Missouri River shoreline! 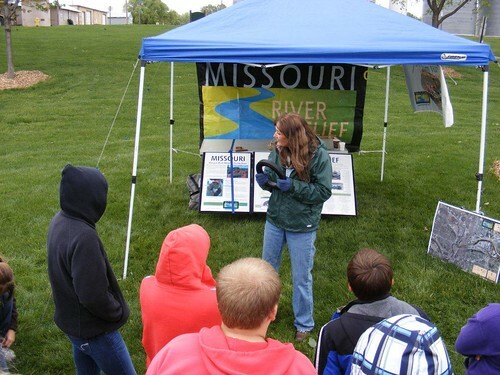 The day before, Friday, May 7th, about 260 students from five schools in South Dakota and Nebraska participated in the Watershed School Festival as part of the effort. That evening Missouri River Relief's Vicki Richmond gave a presentaion on "Trashology" at the YC Alumni Center at the Yankton Summit Center alongside Tim Cowman of the Missouri River Institute who presented on "Kayaking and Canoeing the Missouri River".